Having spent a lot of time working with AVR microcontrollers I decided a number of years ago to invest in a dedicated In Circuit Emulator (ICE). At the time Atmel had just released their new Atmel ICE device. This seemed to fit the bill perfectly. Not only did it support traditional JTAG debugging but also debugWIRE. Atmels own propriety debug protocol aimed at low resource devices such as the ATMega88/168/328 family. I purchased the Atmel ICE basic kit. 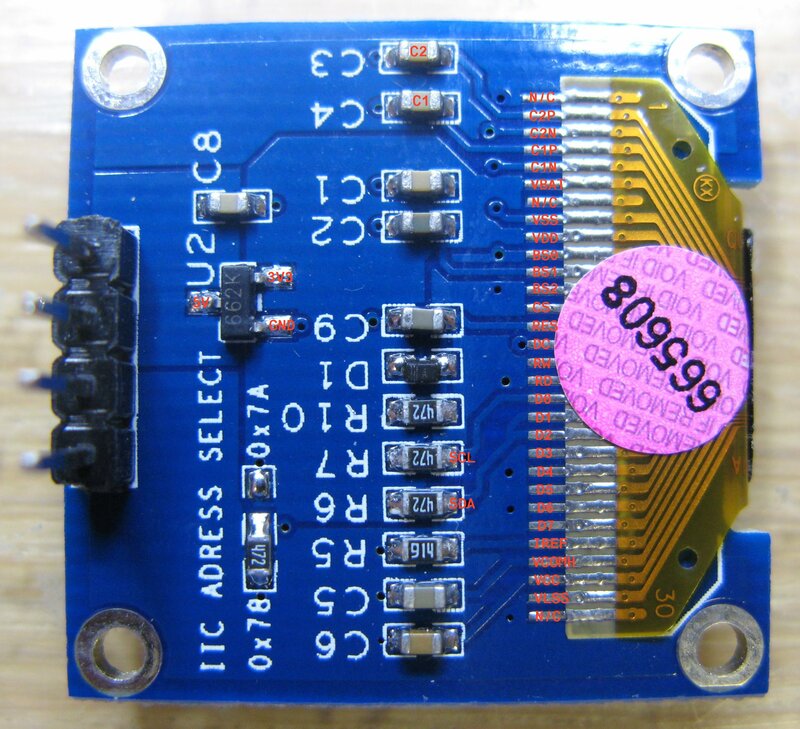 The kit consists of the Atmel ICE and a 10 pin ribbon cable to 10 to pin JTAG (0.05″ pitch) and 6 pin (0.1″ pitch) SPI connector. The full kit available at a much greater cost shipped with a number of different cables and adaptors. As debugWIRE uses the RESET line for debugging I deemed the 6 pin SPI cable would be all I needed. Or so I thought. Moving on a few years I find myself now working with the ATmega32U4 again (I needed USB functionality) and to my surprise this device does not support debugWIRE only JTAG. What!!! How can this be? I was wondering if Atmel sold those additional debug cables separately? Turns out they do but they are almost £50. After shelling out just shy of £100 in the first place I wasn’t prepared to spend another £50 on cables. So I set about building my own adaptor. The main problem I faced was the Atmel have used 0.05″ (1.27mm) pitch connectors rather than the more readily available standard 0.1″ (2.54mm) pitch connectors. 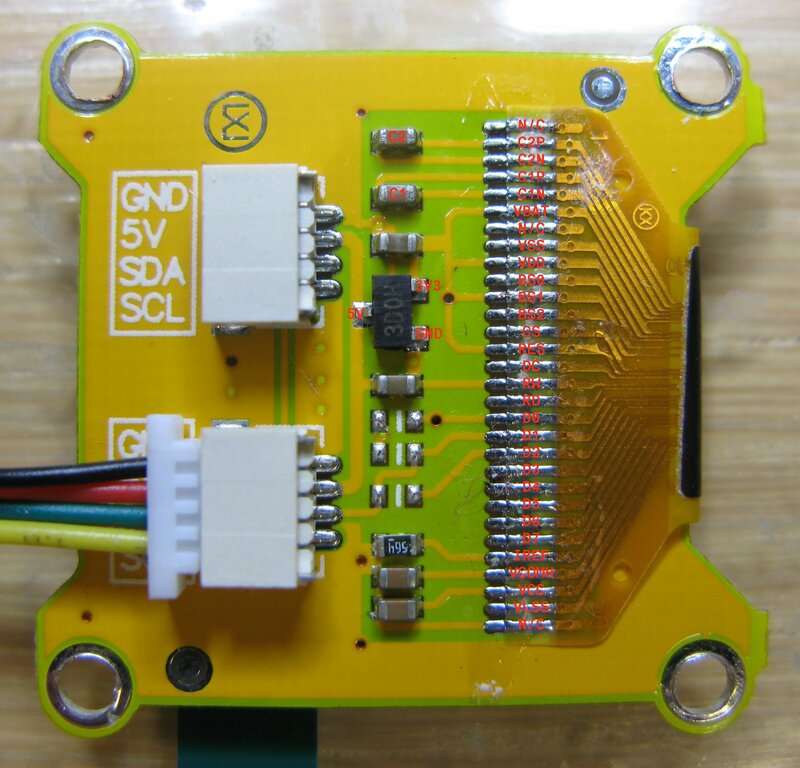 What I needed was some form of breakout board or even something to convert from the 0.05″ pitch connector to something more manageable. After trawling the net it turns out Adafruit have a Cortex SWD adaptor which in essence is a 0.05″ pitch to 0.1″ breakout board. The pin mapping is one to one so assuming you ignore the silk screen it should be easy to interface to the ATmega32U4. The best thing about this solution is the price, I managed to get two of these boards from a local supplier for just £3. The development board I am currently using is an OLIMEXINO-32U4 an Arduino Leonardo type design from Olimex. The table below shows the Cortex SWD to AVR JTAG pin mapping. Also shown is the JTAG connections of the 32U4 (or Arduino Leonardo if you prefer) development board. Below you can see a picture of my setup. I am not sure if they are needed but I did add 10K pull ups to all of the control lines TCK, TDO, TMS and TDI. One thing that had not dawned on me was the fact JTAG is not enabled by default. The pins designated to the JTAG interface PF4-PF7 are used as analog inputs. So in order for JTAG to work you need to ensure the JTAGEN fuse is programmed. This can be done through the ISP interface in the normal manner. Once I had that programmed I could successfully download and debug my code on target. Result. This entry was posted in Blogging and tagged Arduino, ATMega32U4, Atmel, Debugging, debugWIRE, ICE, JTAG, JTAG ICE, Microchip, Olimex on June 20, 2017 by mikesmodz. I recently inherited a completely dead LG 32″ LCD TV from my parents. Apparently this TV set was working fine one day and completely dead the next. So I thought I would have a look and see if I could get it back up and running. Upon receiving the set the first thing I did was try and power it up. Nothing completely dead. No standby light nothing. Checked the fuse in the plug (obviously) and that was fine. Time to dig a bit deeper. With the current symptoms the obvious suspect is going to be the power supply. The internet is strewn with examples of power supplies going bad in these TVs and people on eBay are even selling repair kits for anyone wanting to repair them. After carefully removing the back panel I had managed to expose the power supply board. I must say a bit of a beast by all accounts. But if you think about the job it has this is to be expected. Fortunately most of the connectors were labelled with the expected output voltages. Probing around on these pins showed no voltage on any of them. Checking the mains into the board gave a reading of around 230V AC. Checking the voltage after the 5A fuse on mains input read nothing. Turns out this fuse had blown. Question is why? On closer inspection smoke damage can be seen on the large heat sink holding the power transistor, bridge rectifier and rectifier diode on the input stage. My first thoughts were one of these may have been damaged but on closer inspection it turns out the smoke was caused by a 220 pF 2Kv ceramic disc capacitor just in front of the heat sink (shown in the image above directly between the transformer and the heat sink) exploding. Which explains why the fuse may have blown. Probing around the remainder of the input stage the other components appeared to be fine as far as I could tell. Turning my attention to the electrolytic capacitors (shown above) on the output stage I could immediately see a number of these were starting to show the tell tale signs of failure with at least three of them having significant bulging. So I decided I would replace all of them just as a matter of course along with the ceramic disc capacitor that had blown. Once all of the new components had arrived and been fitted along with a new fuse I powered up the board on the bench and now had a 5V standby voltage present. After fitting the board back into the TV and a quick press the power button on the side and the TV sprung back into action. Result. So a nice easy fix this one. Total spend was about £3 whereas a refurbished power supply board runs to around £30. And for a TV only worth probably that in the first place it hardly seems worth it. This entry was posted in Blogging, Teardowns and tagged 32LC56, LG, Power Supply, repair, SMPS, Television on July 4, 2016 by mikesmodz. In a recent project I used a small 128×64 pixel OLED display module. These modules are great because the provide a clear and vivid display while requiring no back lighting. The display I used had a Systech SSD1306 controller fitted. The internet is rife with examples of code for driving these displays so I had it up and running with fairly minimal effort. Having decided to use these displays on another project I am currently working on I found them on the R/C model site HobbyKing. Turns out the MultiWii flight controller (Arduino based flight controller originally using gyroscopes and accelerometers from the Wii controllers) uses an add-on OLED display module which no surprise features a 128×64 OLED display driven but the SSD1306 controller. As I was already ordering from Hobby King I decided to bundle one in with my order. When the display arrived I assumed since both modules used the same display drivers the code I had already written would work out of the box. Wrong! Come on things are never that simple. Time to start investigating. First thing was to look at the two displays see how they compare. One thing that strikes you straight away is the lack of components on the new display (yellow PCB) compared with the old display (blue PCB). Next step was to start reading the data sheet to see how this controller is configured. The pin out for the connections to the display can be seen below. I have also labelled them on the pictures above. 2 C2P Charge pump capacitor. 3 C2N Charge pump capacitor. 4 C1P Charge pump capacitor. 5 C1N Charge pump capacitor. 6 VBAT DC/DC converter supply. 9 VDD Logic power supply. 15 D/C Data/Command select. In I2C mode, this pin acts as SA0 for slave address selection. 18 D0 Input/output. When I2Cmode is selected, D0 is theserial clock input SCL. 19 D1 Input/output. When I2Cmode is selected, D2 & D1 should be tired together andserve as SDAout & SDAin. 26 IREF Brightness current reference. 27 VCOMH COM signal high voltage. A capacitor should be connected between this pin and VSS. 28 VCC OEL panel power supply. A stabilization capacitor should be connected between this pin and VSS when the converter is used. The controller has an internal charge pump regulator circuit for generating the 7.5V required by the display. Two external capacitors are required. These are connected between C1P/C1N and C2P/C2N and can be seen on both displays. Both VCC and VCOMH have decoupling capacitors down to GND as outlined in the data sheet. The brightness current is set by the resistor between IREF and GND. The working display using 910K while the non working display opting to use 560K. The 3.3V regulator provides the required logic voltage. Interestingly it turns out the controller supports communication over I2C, SPI (3 and 4 wire) and parallel. The protocol selection pins BS0-BS2 allow different protocols to be selected. Both displays have BS0 and BS2 are tied to GND while BS2 is tied to the positive supply which as expected sets the mode to I2C. When configured for I2C mode D0 acts as the serial clock input. The data sheet stipulates that D1 and D2 should then be connected together to act as the serial data line. On closer inspection of both displays it becomes apparent this is the case the working display (blue PCB) but not with the non working display (yellow). Another thing the working display appears to have pull up resistors connected to SCL and SDA. Something you would expect with I2C comms. The non working display has no pull ups fitted. Having said that the non working display appears to have three unpopulated foot prints on the PCB allowing for pull resistors to be fitted and for D1 and D2 to be connected together. So the first I did was to add and a zero ohm link between D1 and D2 joining them together. I didn’t bother with any pull up resistors. After fitting the display back into my development board and powering up to my surprise it worked!! I can only assume when configured for I2C operation D1 acts as the serial input to the controller while D2 acts as the output. Joining the two must allow the acknowledge bit set by the controller to be read by the driver. The driver could have been modified to remove the need for the acknowledgement but this would have meant changing the code to be device specific which I didn’t want to do. One nice feature on the old display is the ability to change the slave address. In I2C operation the Data/Command pin can be configured to set the lowest bit of the slave address SA0. Allowing the slave address to be either 0x78 or 0x7A. Meaning more than one display could fitted on the same bus. Another slight gripe is the lack of power on reset circuitry on the new display. The working display has a simple reset circuit comprising R1, C1 and D9. The RC network ensures the reset pulse is present while the supply voltage rises keeping the controller in reset while the supply stabilises. D9 allows C1 to quickly discharge on power down in order to generate a reset pulse on power up in the case of short power downs or spikes. Having the reset pin tied directly to the supply, in the case of the new display, means the reset pin will rise of the same rate as the supply which is not ideal. The track could be cut and a reset circuit added but since it worked I wasn’t going to start modifying it. This entry was posted in Blogging, Projects and tagged Arduino, ARM, ATMega328, Controller, Microcontroller, Microprocessor, OLED, PIC, SSD1306 on March 17, 2016 by mikesmodz. While looking for a new display on eBay recently I stumbled across a seven segment display module. The module (shown below) features 8 seven segment displays, 8 push button switches as well as 8 LEDs. All of which are controlled by one single driver IC the TM1638. I have never come across the TM1638 before, I have used similar display driver ICs like the MAX7219, but never the TM1638. After some googling I discovered the TM1638 is manufactured by a Chinese outfit known as Titan Micro Electronics. After downloading the data sheet I begun looking to see how this driver is used. At this point I must state the data sheet, which appears to have been translated from chinese to english, badly, leaves a lot to be desired. Fortunately for me the Arduino fanboys seem to love these devices and there is no shortage of information scattered across the internet. So armed with this information I decided to purchase one. Once it had arrived getting it working was fairly straight forward. The module does not come with schematic and I wasn’t going to bother reverse engineering the board to create one (not unless I ran into any issues I could not resolve) so it was a bit trial and error in the early stages. In the rest of the post I will demonstrate how to use this device in more detail. The TM1638 is a LED driver controller with integrated key-scan interface. Communication with the device is via a 3 wire serial interface. The device is capable to of driving up to 8 x 10 LED segments. As well as reading 24 individual key inputs. The display intensity of the LED segments can also be dynamically configured. The supply voltage for the device is quoted as 5V ±10% however have seen evidence of people using a 3V3 supply and not having issues. The LED segments are connected to the device via the segment output pins SEG1-SEG10 and grid output pins GRID1-GRID8. The module I purchased has 8 seven segment displays and a further 8 LEDs. These seven segment displays connect via segment output pins SEG1-SEG8 and grid output pins GRID1-GRID8. The 8 LEDs connect via segment output pin SEG9 and grid output pins GRID1-GRID8. The push button switches are multiplexed together and read via key state output pins KS1-KS8 and key scan data input pins K1-K3. 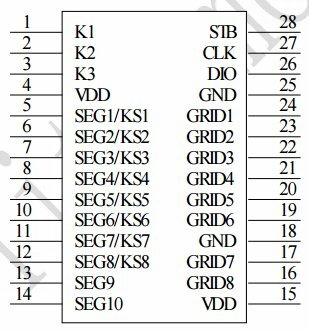 Note key state output pins KS1-KS8 share the same physical pins as the segment output pins SEG1-SEG8. The device simply alternates between driving the segment outputs and scanning the key input states. Communication with the device is via a 3 wire serial interface comprising of a strobe (STB), data input/output (DIO) and a clock (CLK) pin. The strobe pin is used to initialise the serial interface prior to sending data. The state of the DIO pin is clocked into the device on the rising edge of the clock signal. Similarly when reading from the device the state of DIO pin may be read on the rising edge of the clock signal. The protocol used to communicate with the TM1638 is a fairly simple one. The transfer is initialised by first pulling the strobe line low, a command byte is then sent followed by a number of optional arguments. The transfer is then terminated by returning the strobe pin high. Each command sent must begin with the strobe pin being pulled low and finish with the strobe pin being pulled high. The device supports three command types. Determined by bits B7 and B6 of the command byte. Data instruction set 0b01 (0x4X) writes or reads data to or from the device. 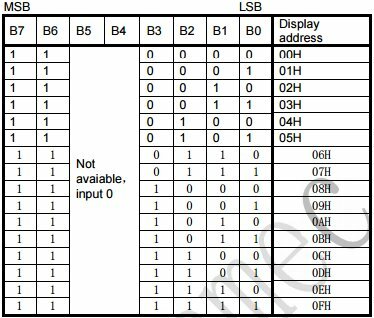 Display control instruction set 0b10 (0x8X) configures the device and Address instruction set 0b11 (0xCX) sets the display register address. The first thing we want to do post power up is initialise the display. To do so we need to send the display control instruction set command 0x8X. The table above shows the individual bit settings for this command and their relevant function. Bits B7 and B6 set the command type, fixed at 0b10 (0x8X). Bits B5 and B4 are irrelevant and set to 0b00. Bit B3 is used to turn the display ON (1) or OFF (0). 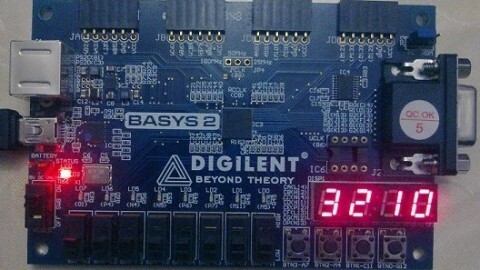 The remaining bits B2, B1 and B0 configure the display intensity. They actually set the pulse width which determines the display intensity. 1/16 (0x00) being the dullest and 14/16 (0x07) being the brightest. For instance if we wanted to turn the display ON with the intensity set to maximum we would send the command 0b10001111 (0x8F). For minimum intensity we would send the command 0b10001000 (0x88). The data instruction set command can perform a number of functions. We can set the data write mode to either write data to a data register or read the key scan data. We can set the address add mode to either automatically increment the destination address while writing data or write to a fixed destination address. There is also a test mode set function which we will not cover here. Bits B7 and B6 set the command type and are fixed at 0b01 (0x4X). Bits B5 and B4 are irrelevant and set to 0b00. Bit B3 is used to set the test mode which we will keep set to 0 normal mode. Bit B2 sets the address add mode (0 automatically increments the address and 1 sets a fixed address). 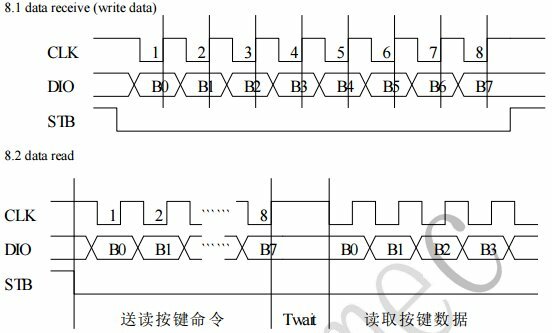 Bits B1 and B0 set the data write mode to be either a write to a data register (0b00) or read from the key scan data register (0b10). The address instruction set command configures the destination address/register we wish to write. There are 16 display registers in total. Bits B7 and B6 set the command type and are fixed at 0b11 (0xCX). Bits B5 and B4 are irrelevant and set to 0b00. The remaining bits B3, B2, B1 and B0 set the display address (0x00 through 0x0F). The data stored in these registers is used to drive the display segments. Which we will cover in more detail soon. This may all look very confusing so let’s cover a couple of examples which should make things a little clearer. Let’s say we want to send the value 0x45 to display register 0x02. The address mode will be fixed since we are only writing one register. So we send the command 0x44 (0b01000100) followed by command 0xC2 (0b11000010) followed by 0x45. If we wanted to send the values 0x01, 0x02 and 0x03 to display registers 0x00, 0x01 and 0x02. The address mode will be set to auto increment since we are writing consecutive registers. We would then send the command 0x40 (0b01000000) followed by command 0xC0 followed by 0x01, 0x02 and 0x03. To read the state of the keys we need to send the command 0x42 (0b01000010) before reading back 4 bytes containing the key states. The details of which we will cover in more detail further on. As already mentioned the display registers allow us to set all of the individual segment states. The mapping of each segment in the display registers can be seen in the table below. For instance segment output pins SEG1-SEG8 which control the seven segments (A-G) plus the decimal point (DP) on grid output pin GRID1 are mapped to display register 00HL (the lower 4 bits of the display register 0) and 00HU (the upper 4 bits of the display register 0). The remaining two segment output pins SEG9 and SEG10 are mapped to the lower two bits of display register 01HL. The remaining bits of display register 1 have no function. This is then repeated for digit 2 using registers 02HL/02HU and 03HL/03HU etc. The module I have has single LEDs all connected to segment output pin SEG9 and no connections to segment output pin SEG10. Some of the modules available on eBay have bi-colour LEDs on which I assume SEG9 is used to drive one colour and SEG10 to drive the other. Again this may appear somewhat confusing so let’s have another example. Let’s say we wanted to show ‘0’ on display digit 1. In order to show ‘0’ we need to set segments SEG1 (a), SEG2 (b), SEG3 (c), SEG4 (d), SEG5 (e) and SEG6 (f) while segments SEG7 (g) and SEG8 (DP) remain unset. We do this by loading display register 0 with the value 0b00111111 (0x3F). For display digit 2 we load display register 2 with 0b00111111 (0x3F) etc. Similarly if we wanted to energise the LED1 we would need to set SEG9 by loading display register 1 with 0b0000001 (0x01). For the LED2 we would load display register 3 with 0b0000001 (0x01) etc. When it comes to reading the input keys. A maximum of 24 keys may be read by the device. These are all arranged in a 3×8 matrix format. The key states returned from the read key scan data command as four bytes encoded as follows. BYTE1 contains the key input states K3 (B0), K2 (B1) and K1 (B2) for key state output KS1 and K3 (B4), K2 (B5) and K1 (B6) for key state output KS2. BYTE2 corresponds to key state outputs KS3 and KS4. BYTE 3 corresponds to key state outputs KS5 and KS6 and BYTE4 corresponds to key state outputs KS7 and KS8. Bits B3 and B7 in all four bytes are irrelevant and are ignored. For example to read the input state of the key corresponding to input state K2 and key state output KS8 we read bit B5 of BYTE4. To read the input state of the key corresponding to input state K3 and key state output KS1 we read bit B0 of BYTE1. After a bit of trial and error I discovered the eight keys on my board are all mapped to input state K3. So by checking bits B0 and B4 of each of the 4 bytes read I was able to determine the state of all of the 8 keys. I have created a basic driver for the TM1638 (written in C) using Atmel Studio. The driver has been tested on a ATMega328 (Arduino Nano) development board. However the code could easily be ported to any other platform if required. All of the project files and an example implementation are all available on my GitHub account. This entry was posted in Blogging, GitHub, Projects and tagged Arduino, ATMega328, Controller, Display, LED, Microcontroller, Seven Segment, TM1638 on November 25, 2015 by mikesmodz. I recently signed up with Udemy which claims to be the world’s largest destination for on-line courses. A rather tall order and time will tell. However they do have a huge selection of courses available covering everything from programming to break dancing!! Some of courses are rather expensive but they regularly offer special promotional rates on a lot of these courses that does make them more attractive. I have just completed my first course a course created by a reader of this blog by the name of Jordan Christman. Jordan’s course entitled “VHDL and FPGA Development for Beginners and Intermediates” is an excellent introduction to VHDL and FPGA development. Jordan introduces the basics of FPGAs and VHDL before moving onto the development tools used and then takes a hands on approach developing, simulating and running simple designs on target hardware platforms. I can thoroughly recommended this course to anyone wanting to get into FPGA development. Well done Jordan. This entry was posted in Blogging and tagged Altera, FPGA, ISE, Verilog, VHDL, Xilinx on May 20, 2015 by mikesmodz. With the case now modified to fit the new joystick and buttons I moved onto the interface board. Rather than buying one I decided from the onset that I was going to design my own. Those you buy of the shelf in my opinion are just way overpriced for what you get. The majority of which are keyboard encoders. All I needed after all was a simple joystick to USB converter with support for up to eight buttons. 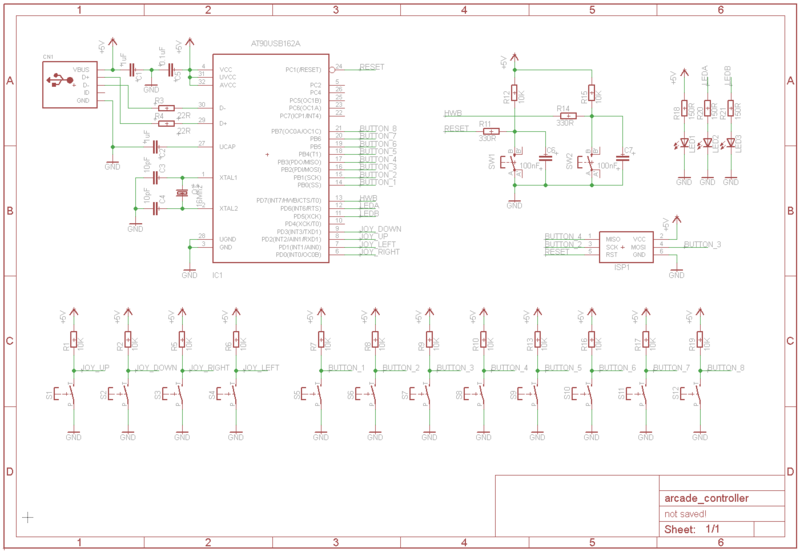 The design I came up with encompasses a Minimus AVR development board I already had lying around. These boards are ideal for USB projects. They feature an Atmel AT90USB162 micro controller with full speed USB controller which makes implementing USB applications a breeze. For the firmware I opted to use the LUFA (Lightweight USB Framework for AVRs, formerly known as MyUSB). I have used LUFA a lot in recent years because I find it extremely easy to implement as well as being extremely well documented. With the design laid out on strip board I started on the firmware. Rather than starting from scratch I took the joystick class driver example provided with the LUFA and begun modifying it to suit my needs. The example project implements a Human Interface Device (HID) class joystick driver. Since most operating systems support the USB HID classes out of the box there is no need for any third party drivers. Within the project is a call back function used to create the HID report to be transferred to the host. All that was needed was, during the call back function, to read the joystick and button states and add them to the generated report. The main USB call would then take care of transferring this report to the host. Every USB device must contain an embedded device descriptor which describe to the host information such as what the device is, who makes it, what version of USB it supports etc. This device descriptor contains a vendor ID (a 16-bit number) which is assigned by the USB Implementers Forum to a specific company. Who in turn assign a product ID (again a 16-bit number) to individual products. In the case of the LUFA joystick example the vendor ID and product ID used are 0x03EB and 0x2043 respectively. Refering to the USB ID Repository on the Linux USB home page shows the registered vendor ID as “Atmel Corp.” (no surprise there) and the product ID as “LUFA Joystick Demo Application”. The VID and PID are communicated to the computer when the device is plugged in, along with text strings describing the vendor and product as well as additional descriptors. I choose to modify these vendor and product strings to something more meaningful to me. With the code compiled and programmed into the AT90USB162 the first test was to check it worked under windows. Once plugged in windows identified the device and installed a suitable driver. Then using the game controllers configuration wizard I was then able to confirm the joystick and buttons were functioning correctly. Moving on time to start testing on the Raspberry Pi. RetroPie detected the controller and allowed it to be configured for use. This is fine for navigating the RetroPie front end but in order to use it with any of the emulators (apart from MAME who has its own set-up) the controller needs registering for use with RetroArch. So exiting RetroPie and checking available USB devices shows the device has been detected on bus 001 device 005. The vendor ID and product ID clearly shown. Then registering the controller for use with RetroArch using the “Register RetroArch controller” script. You can see the modified manufacturer and product strings read by the script. Writing autoconfig profile to: /opt/retropie/emulators/retroarch/configs/tempconfig.cfg. With the controller now registered it was time to start playing. First up Teenage Mutant Ninja Turtles on the SNES which worked great. The Seimitsu joystick has a great feel with lovely movement not too stiff but not too loose either. The buttons respond perfectly with minimal effort, if anything they are little bit to sensitive but that’s fine. 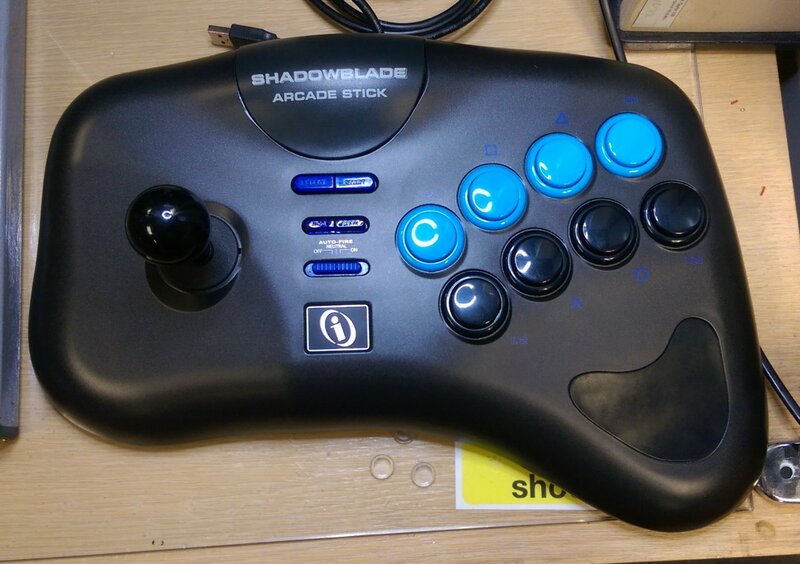 This entry was posted in Blogging, Projects, Retro Computing and tagged Arcade, Controller, Microcontroller, Microprocessor, PSX, Raspberry Pi, Retro, RetroPie on April 15, 2015 by mikesmodz.